Testimonials and feedback from our treasured clients. I just wanted to drop you a quick email to say a big thank you. Your cake was absolutely outstanding, it was exactly what we had envisaged. So many people commented on how beautiful it was and how extremely talented you were to created such a realistic draping effects and such beautiful sugar roses. Nicky's mother was so impressed we are sending her home to South Africa with a couple of roses as a memento (hopefully they won't be picked up by an eager beagle in the airport). The card you left in the wishing well was a very sweet and greatly appreciated gesture. Due to some fairly meticulous research and planning, we had a lot of great suppliers for our special day, but you were the stand-out by far due to your level of professionalism and organisation as well as the thoughtful gestures that were completely unnecessary, but very appreciated such as the freezing\thawing instructions tucked away in the box for the top tier. I will happily recommend you to anyone, if you ever needed a verbal reference for a client you are welcome to pass on my details. If you didn't take some photos yourself for reference, when we get the professional photos from our photographer, I will make sure you get a copy of the cake to include in your portfolio as I feel it was one to be extremely proud of. Sorry it has taken me sooooo long to get these photos too you. Just can’t thank you for our cake. It was fantastic. It looked amazing and it tasted even better! I have been complimented so many times! Thank you so much for the most amazing, beautifully design and delicious wedding cake ever!!!!! It was so stunning. I couldn't believe how pretty it looked. It was also super delicious!!! Unfortunately, the venue cut the cake as tea and coffee size, not dessert, so a lot of our guests were dying for more cake because of how yummy it was. But thats ok. We got to take the bottom and top tier home. Kept the top tier and the rest we divided with family. Everyone loved it.. The cake has so much flavour and not too sweet, it was just perfection.. The design was simply amazing!!! It was exactly what I wanted…. I hope you are well. I was lovely to meet you face to face the other day when returning the cake stand! I just wanted to email and say a big thank you again for your amazing cake! It absolutely exceeded expectation. It looked incredible and tasted even better! We had heaps left over which is great and both our families have devoured almost all of it already! Here is a pic of us cutting our cake. We will send a pic of the cake once we get the professional ones back. Sorry it has taken so long for me to send you some photos of the cake. These are some of the professional ones we had. It was a beautiful cake and tasted amazing as well. You will be pleased to know that your great work with the heart centre piece is being used at my best friends wedding as well. Just wanted to say a HUGE thank you for our amazing wedding cake! We were blown away by how beautiful it was, it looked even better than we imagined! The 3D roses were AMAZING and looked so real. It also tasted incredible and people were raving about how yummy it was all night and for a days after as well. 10 out of 10! It was also great that you delivered it for us so we didn't have to worry about a thing. Please feel free to use that as a testimonial or point me in the direction of where I can write one :) not sure if you prefer your website, facebook etc. I am still in the process of collecting photos from everyone but I will send you on any cake photos I can get. 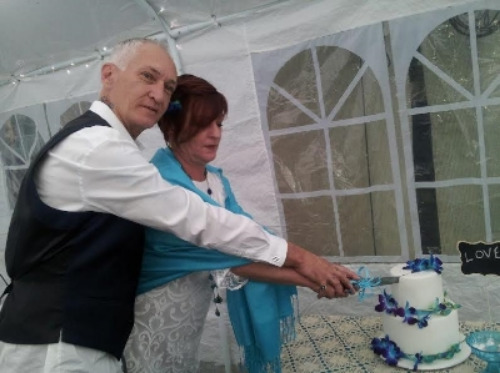 I just want to say a big thank you for the wedding cake for Steven and Karyn. It was beautiful and delicious. Eveyone loved it. I have attached a couple of photos for you to look at. There is one very nice one of the Wedding Cake. Many thanks again for all your assistance with this. Thank you so much for such a beautiful and very delicious wedding cake !!! We will definitely recommend you if anyone will ask us. Here are some of our photos as promised. Just wanted to say a quick thank you for our wedding cake it looked so unbelievably amazing, I was totally blown away when I saw it. Also thank you for the thinking of leaving a take home cake box it was so thoughtful. Your cake was absolutely everything I thought I would be and so much more! Not only did it look amazing and just how I wanted it but it also tasted sooooo YUM! We were even able to save our top tear which is now in the freezer for our anniversary. Just a quick email to see thank you so much for our wedding cake. It was delicious & looked amazing (just how we wanted it to look). I've attached a couple of photos that some friends snapped. Thank you for your lovely card too. ... I really appreciated your professionalism throughout the whole process. I had trouble with a lot of places, getting them to reply to me or get in contact at all. You were always on the ball and quick to respond, for that I am grateful. You sure can copy my words to your website, I would love to let people know what I think of your business. Thank you for your lovely well wishes on our wedding day. And thank you so much for creating such a work of art being our cake. It looked more perfect than the picture I gave you to get ideas from and our guests loved the taste so much that all that was left for us was crumbs (seriously). They are still talking about it months after the day. We were even considering getting you to make a mini cake so we could actually eat some! What can we say, you are amazing. Shoot me an email once you receive this card and I will send through the ‘cutting’ pictures. I'm so sorry I haven't been in touch sooner. I have been waiting to get some photos back of the cake and get them to you. We absolutely loved the cake, you did an amazing job. The cake was so stunning I didn't want to cut it but I'm glad we did as it tasted amazing. I let everyone know that you did the cake for us and I just can't thank you enough. 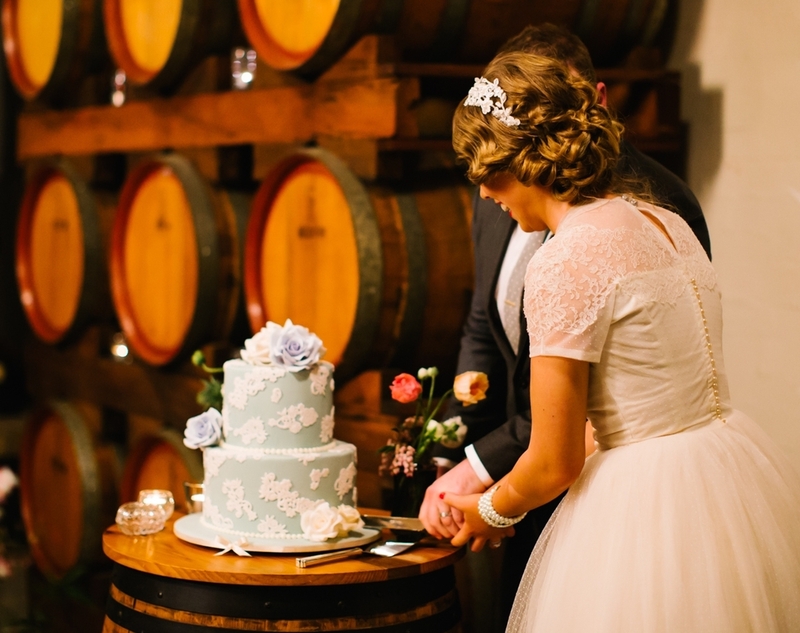 Craig and Elyssa cut their vintage style wedding cake, at Wyndham Estate. Photograph courtesy "Mark and Kara Photography". Craig's Surprise 30th Birthday Cake, presented to him during the wedding reception. Photograph courtesy "Mark and Kara Photography". Just wanted to say thank you so much for the incredible cakes you made for our wedding! Our wedding cake was divine and even better than I had imagined; it was delicious and we received so many compliments on it. Craig's [surprise] 30th birthday cake was incredible and sooooo delicious as well! Thankyou so much for taking the time to decorate it as well, it also looked better than I could have imagined. As promised, here are a few snaps of the cakes. All credit goes to Mark and Kara photography. Thanks again and I hope to enjoy another one of your cakes in the future. NB: Mark and Kara Photography can be found here. I hope you are well. I just wanted to send a quick note to thank you for the delicious cake you baked for our wedding on the 23rd November! A lot of guests could not stop mentioning how beautiful the cake looked and tasted! It was amazing and I could not have been happier with it, so thank you so much!!! Your tasting samples and prompt communication in the lead up to the wedding was also very appreciative. I can not wait for another excuse to enjoy your cake again, and will not hesitate in recommending you to my friends and family. Tony and I just wanted to say a big THANK YOU for designing and making our wedding cake. We have only just gotten back from our honeymoon, however, wanted to let you know that the cake was both beautiful and delicious. We will highly recommend you to our friends and family that plan on getting married in the future. We also plan on contacting you in the future to design cakes for our special events. Thank you beyond thank you’s! The cupcakes were perfection! Just absolutely stunning and they were so delicious that we ate the leftover ones for dinner and then breakfast the next day!! I have an official thank you card coming via snail mail however I wanted to email you some pictures of the cupcakes at the wedding for you to use on Facebook/Website/however else you would like. I thought digital images would be better than a printed 6 by 4 picture. I have also uploaded some photos of the wedding and, I think it worked right, tagged Sweet Perfection Cakes in the photos of the cakes. 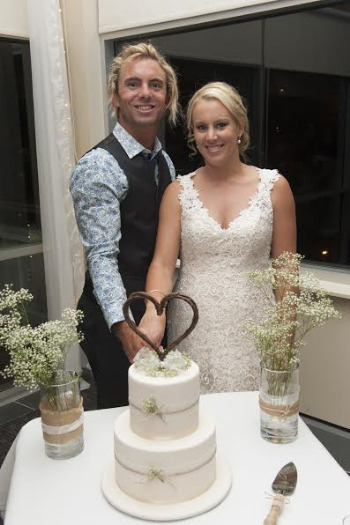 Trudi and Jarrod's Wedding Cake. Would like to thank you for the absolutely amazing and stunning cake that you created for us last Saturday 19th. Everyone raved especially about the Mars Bar layer. The cake is so delicious and we currently have a far bit in our freezer lol. And tastes delicious frozen too. Once we get the professional photos through I'll send you a couple of the photos. How are you? How's business going? I must say that we feel SO terrible that we're only just now getting around to saying a belated thank you to you, our amazingly awesome cake decorator/creator!!! THANK YOU for the most awesome wedding cake creation ever! It was so perfect - we couldn't have asked for anything more. From all of your dedicated & professional service and thorough communciation to all of the details - especially of course for our figurines - before our big day to getting the absolutely perfect colours of the frangipani flowers to our cute figurines -even with squeeze on the bum!!! It was absolutely sensational - even more perfect than how we imagined it to be. We've got our figurines in the family room which opens out from our kitchen so everyone gets to see them when they come over. We love having this special memorable, cute keepsake! Thank you again for all of your hard work & dedication. I know why you've called it Sweet Perfection that's for sure as you're such a perfectionist & thank you for being so for us, Eva!! The Slack Newly Wedded M&M Beans!! I just wanted to let you know that the cake was amazing. It both looked and tasted fantastic. Thank you for your efforts in helping to make Kellie and Adam's day so memorable. Wow fantastic cake! You are very creative & clever, the detail on the cake was exceptional and perfect in every way – everyone commented on the spectacular cake. PS – it tasted pretty awesome too!! Thankyou again it really made her bday party that much more special. We sincerely thank you for your part in making our wedding day so special. We absolutely loved our stunning cake, and had so many compliments on its deliciousness! Thankyou so much for all the time and effort you put into my Wedding cake; all my guests were in envy of all the detailing you had done, like Mitchell's tattoos. I think people took more pictures of the cake than me, lol! Any way i think you are very extaordinary person with a great deal of talent. The cake was a hit, everybody enjoyed it. Keep up the great work, it was way out of my expectations, and I love my wedding cake sooo much. Hi, I just wanted to thank you for the cake it looked amazing and it tasted just as good, so thank you very much. Eva Farragher you are a Gem!!!!! The cake looked absolutely fantastic!!! Not only did it look great but tasted great too. You have done an exceptional job & Vince & I praise your work beyond words.We had an awesome time & had terrific feedback from our guests about the cake so a massive well done to you. When I hear of anyone I know getting married I will certainly point them in your direction. Thanks again for everything Eva, we are eternally grateful. so you might get some more business from it i hope. Thank you for making the dream cake for my husband's birthday. This is Liz H. My husband Tristan had you make one of the most beautiful birthday cakes I've seen - and certainly the best one I've had personally! You truly did an amazing job. The cake was very much the visual centrepiece of the day with multiple guests needing to have their photo taken with the cake! We are still trying to source a photo of Tristan and I with the cake, if you are still interested in seeing one. Once again, many thanks for your many hours of hardwork that must have bee required to put it together. We would happily recommend you to ANYONE in need of a show-stopping cake! Well, the cake was a complete success. As was the party. We celebrated into the wee hours of Sunday morning, great fun. Everyone commented on h...ow fantastic the cake looked and then we we cut and handed it out all we could hear was "OMG this is sooooo good", "hmmmmmmm, oooh, yum, yum", "this is the best cake I've ever tasted"... We agree! Mark and I absolutely loved it along with everyone else. Mandi told me that you made it a bit bigger so that it would look better, thank you very much for that, it really did taste as good as it looked. Even the black icing tasted great. I have given you card and email to a few people who will definitely be in contact with you. I can't recommend you highly enough. Again Eva I can't praise your beautiful cake and expert skills enough. Kim.... and Mark of course! Thank you so much for our cupcakes and cookies for our wedding on March 5th 2011. They looked amazing and tasted even better! Everyone mentioned how yummy they were and have had numerous people ask for your details. Eva! the cake was stunning, absolutely amazing. I can not thank you enough for creating the cake of my dreams. You blew me away - you're amazing !!!!! Cake exceeded expectations. Lindsay (Rhys's brother) and his friend customised the goggles and created a replica of the bandana face mask he wore on the Japan slopes. I should of had a few buisness cards. Thanks very much for the wonderful cake and cupcakes they were gorgeous and everyone loved them. Sorry it has taken me a little while to send you this email, both my husband and I just wanted to thankyou for making our very cute wedding cake. We had so many compliments of both how the cake looked and even more so on the taste of it. The cherry ripe mud cake was a big hit. Thankyou for sending that note along with it regarding the elephants, we managed to keep them and now display them in our home. Thank you again. I am writing to thank you for the amazing cake you created for Courtney's birthday. It was sensational. Your decorative work looked better than I could have imagined and I can see you the cherry ripe cake is so popular. The layer of chocolate really makes it. I have passed on your contact details to a few of the guests who were also incredibly impressed. Thank you. We could not have been any happier. We wanted to say a very big thank you for our gorgeous wedding cake. The cake was perfect and tasted beautiful! Thank you for all your help over the past 6 months. Its been greatly appreciated. I just wanted to say thank you again for making Alicia & Dom's crouquembouche & mud cake wedding cake. It was absolutelyamazing and the little sugar people were just perfect. Everyone commented on how great it looked & how fantastic it tasted. Thankyou so much for the cake, it was beautiful, and I had so many comments from guests about the taste. It was nice and simple, exactly how I imagined it. Thankyou again. I just wanted to thank you so much for the wonderful cake you made for Lauren's wedding - it was just beautiful. Everyone commented on it and Lauren couldn't have been happier. Again thank you so much. I know that Jan has already telelphoned you to thank you for the cake, but I also wished to pass on my thanks and appreciation of an excellent job. The cake was beautiful. Not only was it decorated superbly, but it tasted delicious. It was a perfect addition to our celebrations. I just wanted to email and say a huge thank you for the beautiful cake you made for us! Everyone loved it, and it looked so beautiful! We actually ended up cutting it earlier than planned in the day because everyone kept asking us when they could try some. We will definitely be giving you a call when our wedding rolls around, probably in winter next year! Thank you so very much for the cake. It was just beautiful... we all loved it! I hear you are not short of work, but I put some of your business cards on the cake table and noticed several had disappeared by end of the event. Hope you don't mind too much. I just want to say thank you for making me my banana cake.You did a really good job and everyone in the team liked it. Great combination of cake & icing! Just wanted to thank you for the gorgeous cake. Just beautiful. Thank you so much for all the work you did. It is very much appreciated. These will be something we will keep and cherish forever. Our Wedding cake was perfect, we all loved it. Thankyou also for being so great to deal with. All I can say is Oh My Goodness!! Our wedding cake was truly AMAZING!! Thank thank thank you so very very much for all your hard work and effort! It was exactly what we wanted and more! Everyone was in awe of our cake and couldnt believe it was real and that we could actually eat it! We didnt want to cut it, but we have plenty of photos to remember it, and the toppers are awesome! Thank you again so much, very appreciated and will definately be coming to you next time we need a unique cake!! We just want to say thank you again for your massive effort to produce such an awesome cake! So much time must have gone into it to get all the little details, like the starfish, and the colours on the waves, and the cake toppers! All were so awesome and much appreciated! The photos you have taken are so amazing! The photographer on the night took millions from all different angles, and I am pretty sure almost everyone at the ceremony took photos as they couldnt belive it was a cake! It was so delicious as well, everyone commented how yummy it was, and most went back for seconds! Thank you again! We just wanted to let you know how much we loved Natalie’s Baptismcake! Everyone was saying how great it was and asking where we got it from. Ittasted really yummy and the attention to detail was immaculate. Eva, my cake is stunning and it just blew everyone away at the party. It was a very sad moment when I had to cut it. I LOVE my cake! !